Our mission is to preserve selected archival sites, provide informational materials and conduct educational programs concerning the heritage of iron production in the Tri-State section of Connecticut, Massachusetts and New York including Litchfield, Berkshire, Dutchess and Columbia counties. The 1731 discovery of superb limonite and goethite iron ore at Salisbury’s Ore Hill led to the iron forges of the 1700’s and the larger blast furnaces of the 1800’s. Ore at Lime Rock, Furnace Village (Lakeville), and East Canaan. When heated at the forges with charcoal at just the right quantities and temperatures, the ore produced iron for anchors, mill parts, and farming equipment. New slitting mills meant nails could be made from rolled iron, far better and cheaper than the old hand-crafted style. The first blast furnace in the area was built in 1762 by Ethan Allen, Samuel Forbes, and partners at the outlet of Lake Wononskopomoc in Lakeville. With Forbes as Ironmaster, the furnace was in operation a decade later to cast the cannons necessary for General Washington’s army. Blast furnaces were much larger than the forges, producing tons of iron each day. During the 1800’s forty blast furnaces operated in the upper Housatonic watershed. The tower at the Beckley Furnace, one of three furnaces along the Blackberry River in East Canaan, remains today on state owned land. Other furnaces operated in Lime Rock, Huntsville, Taconic, West Cornwall, Sharon, and high on Mt. Riga just north of Salisbury. Many of these sites still convey the memories of the hard, dangerous but prosperous activity. Cast iron from the furnaces needed further treatment for many uses. Soon the area had the foundries, finery hearths, puddling furnaces, and rolling mills to produce the final products. As the country expanded and new iron industry centers developed to the west, the role of Salisbury iron decreased. The last furnace closed in 1923. The year 2008 was one of increased activity along the Iron Heritage Trail. Much of the added interest in the history of production in the Salisbury Iron District came about as a result of the thirty minute documentary film Visions of Iron produced by the Sharon Historical Society. Following the May premiere attended by over 400 people the film has been used in schools in both Connecticut and Massachusetts as well as part of adult programs and on local cable TV channels. At the Beckley Furnace, t he centerpiece of the Iron Heritage Trail, Saturday programs were conducted from June through November. The furnace grounds with excellent signage and open from dawn to dusk year around, showed a sharp increase in both local and out of the area visitors. Inside the Beckley office building volunteers continue the construction of a research / study center. Through the year the Iron Heritage Trail group also worked closely with William Edwards at the Richmond Furnace, The Salisbury Association, The Sharon, Kent and Amenia (NY) historical societies and the Sloane Stanley and Connecticut Mining museums at the Kent Furnace. Additional studies also commenced at the Sage/Joyceville Furnace (1847-1854) and Mt. 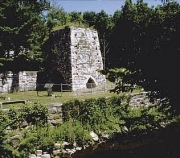 Riga Furnace (1810-1856), the only standing cold blast furnace in New England. Both the Salisbury Association and the Sharon Historical Society received grants from the Upper Housatonic Valley National Heritage Area for the production and placement of informational signs. Preliminary study was started on a potential Marble and Lime Trail that would very much parallel the Iron Heritage Trail.